Long and short span railway bridges. The only published work (apart from job reports) of John Roebling, designer of the famous Brooklyn Bridge, this splendid book is concerned to show the suitability of the suspension bridge for railway use, in particular a combined arch and suspension bridge system, which he calls a "parabolic truss", demonstrating its superiority and economic advantages over lattice and tubular girders. I K Brunel in his Saltash bridge had successfully made use of such a combination, building parabolic arches with their ends tied together by suspension chains. Roebling cites this bridge but his own system is somewhat different in that the springing of the arched truss is well below the level of the saddles and is intended to provide the necessary stiffness to distribute the point load of a moving locomotive and train, the major problem to be overcome in designing railway suspension bridges. The present work details his optimum design for a bridge with a central span of 500ft and two side spans each of 300ft, describing its component parts and method of construction and proving it theoretically. 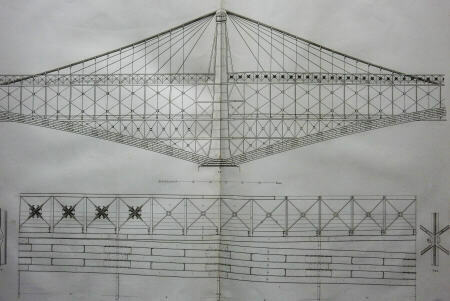 It also contains his designs of 1855 and later for a "parabolic truss" bridge to carry both road and rail over the Mississippi at St Louis, a project eventually carried out by Eads. Roebling's designs have spans of up to 800ft, which he considers to be the practical and economic limit of his bridge system. In view of his experience with the Niagara Falls bridge (completed 1855, span of 821ft), the deep deck beam of which acted as a stiffening truss, he maintains that for longer spans the pure suspension type is the most appropriate form. Although the title refers to short-span bridges, only a small portion of the work is devoted to them. Roebling had intended the book to be the first of several volumes, but died before the rest could be achieved. As it was, this book was itself published posthumously, though he had completed the manuscript and revised most of the proofs and plates before his death. Aimed at the practising engineer and straightforwardly written, using the simplest of calculations, it demonstrates Roebling's design philosophy and his pre-occupation with stiffness and with economy of construction. With its series of superb plates it is one of the handsomest books in American civil engineering literature. Folio. (ii) + 50 + (20)pp, engraved portrait frontis. of Roebling and 13 engraved plates (11 double-page and 2 very large and folding). Library cloth, some discreet library stamps throughout. Light stains to the top rh corners of a few plates at the end.